Dead Man's Chest Video Slot Review - Casino Answers! Dead Man’s Chest is a 5-reel, 9-line video slot developed by WagerWorks, featuring a wild symbol, a bonus game and a progressive jackpot. You can play the Dead Man’s Chest video slot at Bovada. Dead Man’s Chest is a quarter slot. Bets on the Dead Man’s Chest slot machine are $0.25, $0.50, $1, $2, $3, $5 and $10 per line. You can select up to 9 paylines per spin. The maximum total bet available is $90 per spin, which is a good betting range for most online slots players. Press the “Bet Max” button to select the maximum total bet of $90 on a spin. 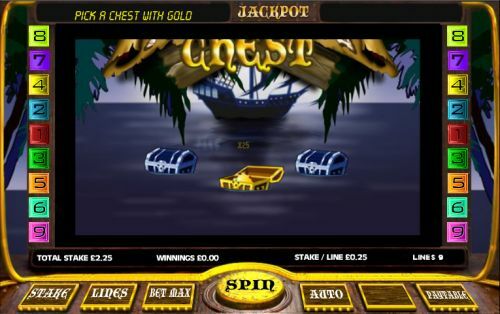 To play the Dead Man’s Chest online slot, select your bet and press the “Spin” button to spin the reels. The Dead Man’s Chest progressive jackpot is won when 5 Pirate Ship symbols appear on a selected payline. The progressive jackpot can only be won during real money play. To play for the Dead Man’s Chest progressive jackpot, please visit Bovada! The Skull & Crossbones symbol is wild and will substitute for any other symbol in the game. The wild symbol will not pay out by itself. The Dead Man’s Chest slot game has a very basic autoplay mode. Hit the “Auto” button to begin non-stop autoplay spins. The only way to stop the autoplay mode on the Dead Man’s Chest video slot is to press the “Stop” button that has replaced the “Spin” button. Dead Man’s Chest is a simple pirate slot with a bonus game and a progressive jackpot. Other than that, there isn’t too much to it, but it can still be a lot of fun to play the Dead Man’s Chest video slot at Bovada! Can players from the United States play the Dead Man’s Chest pirate slot game? No, American players are not able to play Dead Man’s Chest for real money. 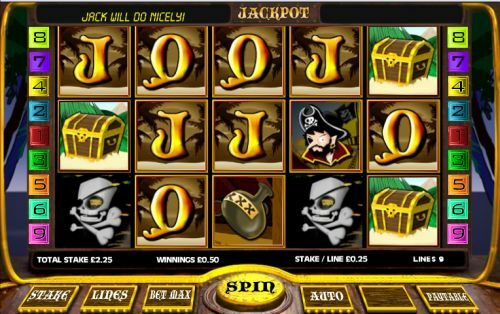 For more pirate slots that you can play, please read our list of pirate slots, matey! Do I need to download any casino software to play the Dead Man’s Chest video slot? No, no software is required to play the Dead Man’s Chest flash slot game at Bovada. Free and real money play are both available as options. If you have any issues with the flash casino, please download the newest version of Adobe Flash Player.